NCAA Will Stop Selling Player Jerseys, Takes Web Shop Down : The Two-Way Stung by fresh accusations that the NCAA makes money off college athletes, the organization has promised to stop selling jerseys and similar products. The move came days after ESPN analyst Jay Bilas tweeted pics of the NCAA Shop selling jerseys corresponding to current players' numbers. A screenshot posted on Twitter by ESPN analyst Jay Bilas shows the results for a search for "manziel" — shirts and jerseys matching Texas A&M star Johnny Manziel. The NCAA says it will stop selling such products. Stung by fresh accusations that the NCAA makes money off college athletes, the organization promised this week to stop selling jerseys and similar products. The move came days after ESPN analyst Jay Bilas tweeted pics of the NCAA Shop selling jerseys corresponding to current players' numbers. "In the national office, we can certainly recognize why that could be seen as hypocritical, and indeed I think the business of having the NCAA selling those kinds of goods is a mistake, and we're going to exit that business immediately," NCAA president Mark Emmert said, according to ESPN. "It's not something that's core to what the NCAA is about, and it probably never should have been in the business." As of Friday afternoon (Eastern time), the entire NCAA Shop has been taken offline. The organization's top officials have said they hadn't been aware of the "issues with the site." Bilas says that he looked into the jerseys after being sent an image showing a screenshot of the NCAA store, in which a search for "manziel" — for Heisman Trophy winner Johnny Manziel — returned results of Texas A&M replica jerseys and shirts with his number 2. Bilas then searched for other notable college athletes, finding school jerseys for, among others, Jadeveon Clowney of South Carolina, Tajh Boyd of Clemson, Denard Robinson of Michigan, and Tyran Mathieu of LSU. As he rolled through the names, he posted each result. In one case, he noted, "Even suspended, ShopNCAAsports.com will sell your stuff. Notre Dame's Everett Golson is still for sale." None of the jerseys Bilas saw used the players' actual names on their backs, as a game jersey would. 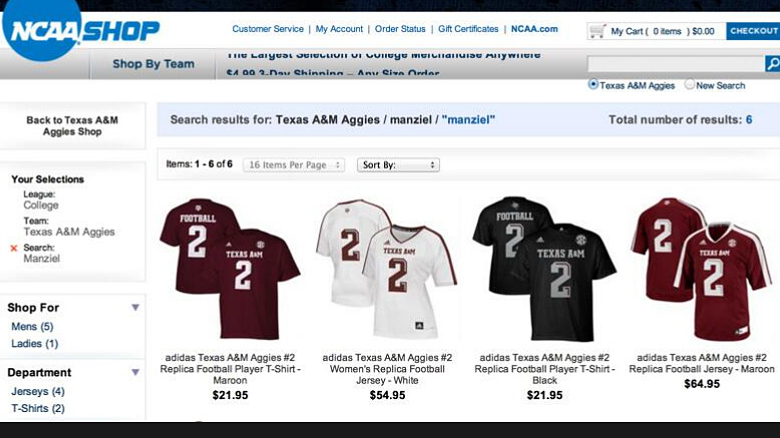 But the Texas A&M jersey had the word "Football" on the back; Manziel's nickname is Johnny Football. That struck a chord with many sports fans, who had been following allegations made earlier this week that Manziel may have broken NCAA rules by signing memorabilia in exchange for money. As word spread of Bilas's scathing tweets earlier this week, the NCAA initially responded simply by removing the search box from its shop website. But on Thursday, the organization said it would stop selling college and university merchandise altogether. NCAA executive vice president Mark Lewis says that its website is being shut down temporarily and will reopen in a few weeks, when it will feature "NCAA championship merchandise only." "It's one thing where if it's on another site and it's being sold. But the NCAA itself, with the NCAA logo — they're selling the players? While at the same time restricting the players from anything more than a scholarship. And when they're in court in the O'Bannon case, saying essentially, under oath, that they're not doing this. It really struck me as egregious." Bilas was referring to the case brought by former UCLA basketball star Ed O'Bannon, who is among many college athletes who take exception to the NCAA and its licensing company using their likenesses in video games. In some cases, those images are being used decades after their college careers ended. As NPR's Tom Goldman reported in June, "the NCAA is very worried about the scope of the suit, which potentially includes current athletes and the use of their images in televised games; meaning March Madness, BCS football games. Considering the billions of dollars the NCAA and conferences rake in from TV contracts, this has considerably upped the stakes and potential losses for the defendants."